It is hard to believe it is already September. The 2012 MLB season has flown by, which makes sense since Washington Nationals fans have had a lot of fun so far! Monday, September 3 was a very exciting day in Nationals history. The Nats won their 82nd game of the season giving them their FIRST WINNING SEASON since moving to DC in 2005 from Montreal. Fans are cheering, singing and dancing at the ballpark like no other year to date. Hopefully it is just the beginning to a long future of October baseball in DC. So it is about time that we posted the list of music used by the Washington Nationals players this season! Fans love walk-up music. It is always a popular topic on Twitter, Facebook and discussion boards. Some players select music that gets them fired up, suits them perfectly or even pokes fun of themselves (i.e. Matt Stairs last year using Toby Keith’s “As Good As I Once Was“). It can be a small window into the player’s personality. Some players stick with the same song season after season and even years after leaving the Nationals or baseball all together, fans immediately think of that player every time they hear the song (i.e. Chad Cordero and Metallica’s “King Nothing“). There are also superstitious players that change their music when they are slumping at the plate. And some have a handful of songs that are used in rotation. 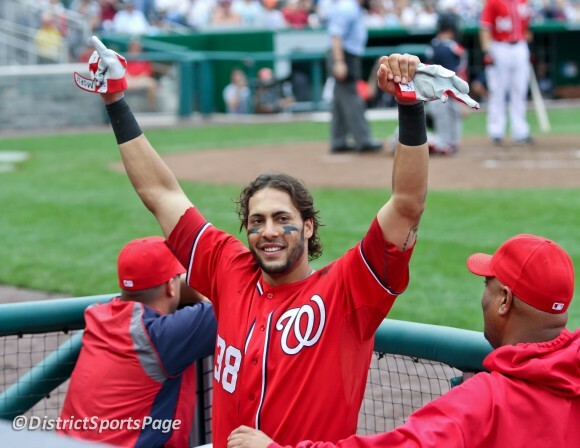 Michael Morse probably has the most eclectic taste in songs used. His most popular song is “Take on Me” by A-ha, which he has used for the last few seasons. The music is usually cut off before it gets to the high part of the chorus, so the fans finish it off! It started in 2010, but has finally caught on and fans voices are even heard on TV. Join in next time you’re at the park. All of the following songs have been confirmed through various sources including programs like Shazam, Soundhound, as well as players tweets, interviews, etc. All of the songs have been used at one point throughout the 2012 season. We’ve included links to videos, however, remember that there is only a few seconds of the song used during the walk-up so it may sound different at the beginning at first. There is a lot of Natitude on the list! Please help us keep list up to date and post additional songs that we may have missed in the comments. We are missing songs for Sandy Leon, Carlos Maldonado and Jhonatan Solano. Thank you! Enjoy! Roger Bernadina – Yeah Ya Know by T.I. Danny Espinosa – Show Me Love by Steve Angello & Laidback Luke feat. Robin S.
Ryan Zimmerman – Whatever You Like by T.I. Thank you! I forgot about Promises and Black and Yellow. Don’t remember Lannan coming out to the Deftones. Was that his batting walk-up or pitching warmup song? Thanks again. I’ll get them added, along with a few more from tonight’s game. Confirmed with Lannan too. Wang’s song is “Battle Without Honor Or Humanity.” Thanks so much for your help Tolu! Hi! Det also walks out to “Wherever You May Roam” by Metallica.